Baby Critically Burned During SWAT Raid, Stun Grenade Thrown into His Crib. 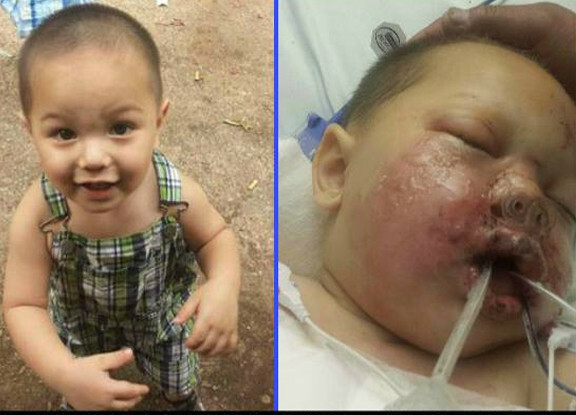 Home Badge Abuse Baby Critically Burned During SWAT Raid, Stun Grenade Thrown into His Crib. The state’s immoral, brutal, and asinine war on drugs has claimed another innocent victim. This time it is a 19 month old baby. In a multijurisdictional raid in Habersham County police barged into the home of Wanis Thometheva at 3:00 am. During the raid one of the uniformed men, tasked with caging people for possession of substances the state deems illegal, threw a stun grenade into the crib of a 19 month old baby. Alecia Phonesavanh, the mother of the 19-month old, was staying at her sister-in-law’s home when cops smashed in. Phonesavanh’s son is in the burn unit of a local hospital. The grenade blew a large laceration in his chest and ripped his face wide open. There were many pictures taken but they were so graphic that the local news station chose not to share them. Cornelia Police Chief Rick Darby confirmed that the raid took place at the home just before 3 a.m.
Deputies said they bought drugs from the house and came back with a no-knock warrant to arrest a man known to have drugs and weapons. They arrested Wanis Thometheva, 30, during the raid. This is an absolutely horrific example of the innocence slaughtered in the name of the war on drugs. How many more innocent lives will be ruined by the state’s attempt to regulate personal choice? The war on drugs is not a ‘war’ on ‘drugs’ at all. It is a war on personal freedom. The war on drugs grants the state the power to arbitrarily create ‘criminals’ out of individuals who’ve caused no harm to others. It’s an assembly line of state sanctioned violence and corruption against those of whom it is selectively enforced. The drug war leaves in ruins the lives of those it destroys either through arrest or imprisonment or worse, state sponsored murder. These political leeches have every reason in the world to support this debauched war against personal freedom for it employs millions of them. Without the war on drugs, politicians, bureaucrats, police, and military alike would have to prove their worth through other means. If you take away the ability of the state to capriciously declare portions of the general population its “enemy,” you take away the reason for the brutality. It is for the millions whose lives have been ruined, and the millions of future lives, that we declare the war on drugs morally bankrupt and therefore nullified. We, as humans, can no longer stand idly by as our fellow humans are savagely beaten, kidnapped, locked in cages, and even murdered for their personal choices, which cause NO HARM. Check back here to find out when and how the internationally peaceful resistance to this criminal war will begin. The Free Thought Project will not stop until PEACE is brought to this repulsive WAR! Baby Bou did not have insurance and he is going to require many surgeries to even be stabilized. Please show your support here.